The Chairman of the Workers' Party of Korea (WPK) is the head of the Workers' Party of Korea, the ruling party of North Korea. The Chairman also serves as head of the Central Military Commission of North Korea and Chairman of the State Affairs Commission. Since the WPK's formation in 1946, the leader's post has been titled as Chairman (1946–1966), General Secretary (1966–2011, vacant from 1994–1997), First Secretary (2011–2016), and Chairman again since 2016. The office of Chairman of the Central Committee was established at the 1st Congress (held in August 1946), and elected Kim Tu-bong (who was not a member of the Kim family) to the office. After the WPNK merged with its southern counterpart in 1949, Premier Kim Il-sung, who had held the real power since independence, became chairman of the merged party. The post was replaced at the October 1966 2nd Conference by the General Secretary of the Central Committee; through this office, Kim Il-sung became the formal head of the party's Secretariat. After Kim Il-sung's death in 1994, the post was vacant for three years. 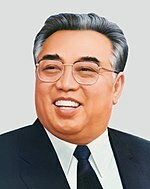 On 8 October 1997, Kim Jong-il was appointed to the new office of General Secretary of the Workers' Party of Korea in a joint announcement by the Central Committee (CC) and the Central Military Commission (CMC) of the Workers' Party of Korea: "[The CC and the CMC] pronounce comrade Kim Jong-il as general secretary of the party, based upon the wishes of the entire People's Army, people, and the members of the party." At the 3rd Conference, the party charter was amended to require the general secretary to concurrently chair the Central Military Commission. When Kim Jong-il died the WPK left the post of General Secretary vacant at the 4th Conference, making him "Eternal General Secretary". Kim Jong-un was elected to the office of First Secretary of the Workers' Party of Korea, which was established to "represent and lead the whole party as its head and materialize the ideas and lines of Kim Il-sung and Kim Jong-il." At the 7th WPK Congress the office of First Secretary of the Workers' Party of Korea was abolished, and replaced by the office of Chairman of the Workers' Party of Korea. The WPK Chairman alongside his vice chairmen make up the WPK Executive Policy Bureau. The office of Vice Chairman and the organ of the Executive Policy Bureau was established at the 7th WPK Congress in 2017. Currently there are 9 vice chairmen; Choe Ryong-hae, Kim Ki-nam, Choe Thae-bok, Ri Su-yong, Kim Phyong-hae, O Su-yong, Kwak Pom-gi, Kim Yong-chol and Ri Man-gon. The Executive Policy Bureau replaced the Secretariat, but its still unknown how and if these two organs have an institutionally different roles from one another. Note CC is an abbreviation for Central Committee of the Workers' Party of Korea and CMC an abbreviation for the Central Military Commission of the Workers' Party of Korea. Vice Chairmen of the party are: Pak Kwang-ho, Pak Thae-song, Thae Jong-su, Pak Thae-dok, An Jong-su, and Choe Hwi. ^ Lankov 2002, p. 31. ^ Buzo 1999, p. 34. ^ a b Yŏnʼguso 1997, p. 668. ^ "4th Party Conference To Convene in "mid-April"". North Korea Leadership Watch. 2 February 2012. Retrieved 12 March 2013. ^ a b Gause 2013, pp. 40–41. ^ Frank 2013, p. 45. ^ a b c d Madden, Michael (20 May 2016). "Deciphering the 7th Party Congress: A Teaser for Greater Change?". 38North. Retrieved 29 April 2018. ^ "The Party". North Korean Leadership Watch. Retrieved 29 April 2018. ^ "Second Plenum of Seventh WPK Central Committee". KCNA. 8 October 2017. Retrieved 1 February 2019. Haggard, Stephen; Herman, Luke; Ryu, Jaesung (July–August 2014). "Political Change in North Korea: Mapping the Succession". Asian Survey. University of California Press. 54 (4): 773–780. doi:10.1525/as.2014.54.4.773. JSTOR 10.1525/as.2014.54.4.773. Kim, Nam-Sik (Spring–Summer 1982). "North Korea's Power Structure and Foreign Relations: an Analysis of the Sixth Congress of the KWP". The Journal of East Asian Affairs. Institute for National Security Strategy. 2 (1): 125–151. JSTOR 23253510. — (2013). "The Role and Influence of the Party Apparatus". In Park, Kyung-ae; Snyder, Scott. North Korea in Transition: Politics, Economy, and Society. Rowman & Littlefield. pp. 19–46. ISBN 1442218126.